MADRID – Few world regions are more culturally and politically complex than the Balkans. And there may be no clearer illustration of the region’s freighted past and present than the life and legacy of one of its exceptional sons: the physicist and inventor Nikola Tesla. Born into an Orthodox Serbian family in 1856 in a town that is now part of Croatia, Tesla’s nationality remains an object of debate in the region. Tesla believed that scientific advances should be used to build bridges between countries, and ultimately to achieve universal peace. But there are some in both Croatia and Serbia who want to appropriate his legacy in ways that do not do it justice. Even Tesla’s contributions to the field of physics have evoked the complicated political dynamics of his native land. In the International System of Units, a tesla is a measurement for the flux density of a magnetic field. And as Federica Mogherini, the High Representative of the European Union for Foreign Affairs and Security Policy, pointed out a few months ago, “The Balkans can easily become one of the chessboards where the big power game can be played.” Indeed, the region has always been situated between competing poles, each projecting power through interwoven economic, political, historical, and cultural links. For the EU, the wars that accompanied the breakup of Yugoslavia in the 1990s signified an utter failure. After the violence subsided, the EU tried to use its own magnetic pull to bring the former Yugoslav territories together through a process of reconstruction and reconciliation. But this strategy has produced uneven results. Although some Eastern Orthodox-majority countries – Greece, Bulgaria, and Romania – have acceded to the EU, the only post-Yugoslav countries to join – Croatia and Slovenia – are predominantly Catholic, a reality that feeds a counterproductive narrative. When Germany and the Vatican quickly recognized Croatia and Slovenia in 1991 and 1992, they reinforced the sense of what the late political scientist Samuel P. Huntington subsequently called a “clash of civilizations.” For Huntington, the Yugoslav wars fit his simplistic paradigm perfectly, with Western Christianity – Catholicism and Protestantism – on one side, and the rest of Europe’s religions on the other. Croatia and Slovenia have both demanded that the “Western Balkans 6” – Albania, Bosnia and Herzegovina, Kosovo, Macedonia, Montenegro, and Serbia – be incorporated into the EU as well. 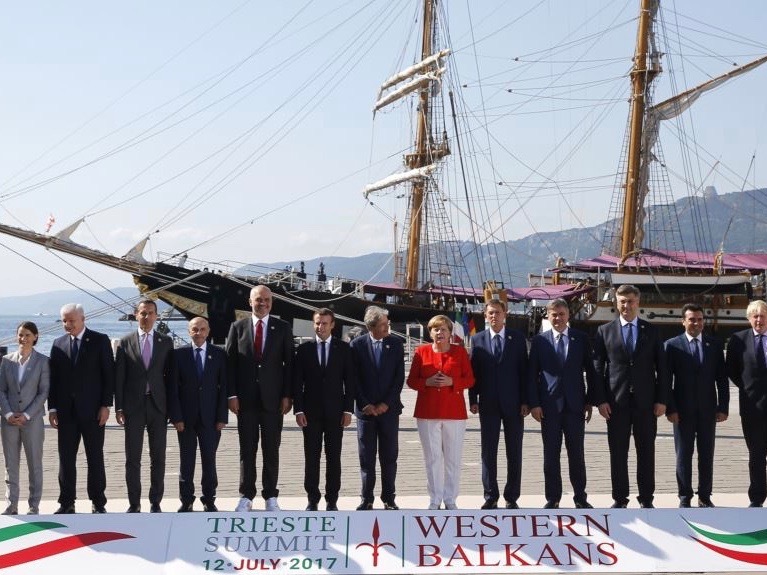 But progress has been hampered by a congeries of bilateral political disputes between Western Balkan and EU countries, similar to when Slovenia, taking advantage of EU membership, temporarily blocked Croatia’s accession. Moreover, circumstances within the EU itself – economic crises and the rise of xenophobic political parties in recent years – have put its enlargement policy on the back burner, with European Commission President Jean-Claude Juncker announcing in 2014 that no new members would be accepted before 2019. At the same time, democratic norms and institutions in the Western Balkans have been eroding. Other countries with a strong influence in the region – not least Russia, Turkey, and Hungary, where the EU has failed to prevent a drift toward authoritarianism under Prime Minister Viktor Orbán – are offering alternative political models for Western Balkan countries to follow. Consider the relationship between Serbia and Russia. During a visit to Belgrade in 2014, Russian President Vladimir Putin went so far as to say that, “Russia, just as it was in the past, will always see Serbia as our closest ally.” In addition to its longstanding cultural ties with Russia, Serbia depends on Russian energy supplies, as well as Russia’s veto power as a permanent member of the United Nations Security Council. As long as Serbia remains in Russia’s good graces, it can block Kosovo from joining the UN. These factors explain why Serbia did not join the EU in imposing sanctions against Russia after it annexed Crimea in March 2014. Bosnia and Macedonia also chose not to participate in the EU sanctions, while NATO members Albania and Montenegro did. Still, the Balkan countries are not simply particles drawn passively toward the magnetic poles around them. Serbia, for example, finds inspiration in the legacy of Marshal Tito, who was president of Yugoslavia for much of the Cold War. Far from being the Soviet Union’s closest ally, Tito was a founder of the Non-Aligned Movement, and excelled at playing the United States and the Soviet Union off against each other. Similarly, Serbia today is officially designated as a neutral state. But it collaborates closely with NATO through its Partnership for Peace, while at the same time hosting military exercises with the Russian army. Likewise, while Serbian President Aleksandar Vučić claims to be firmly in favor of European integration, he has displayed no willingness to distance himself from Russia. Of course, in addition to Russia, China has also opposed recognizing Kosovo. Through its “Belt and Road Initiative,” China has flexed its economic muscle, investing millions of dollars in infrastructure projects in Serbia and other parts of the region. One initiative is a high-speed rail line between Belgrade and Budapest, which is meant to connect the Greek port of Piraeus with Central Europe. The European Commission is currently investigating the Belgrade-Budapest line for possible violations of EU tendering rules. The inquiry hints at an underlying trend: though China does not harbor Russia’s disruptive ambitions, its actions may well leave the Western Balkans questioning their incentive to converge with the EU’s institutional model and accompanying rules. Despite these challenges, the EU maintains a favorable position vis-à-vis the Western Balkans. Excluding Croatia, 74% of Western Balkan countries’ total trade is with the EU, compared to only 6% with China, 5% with Russia, and 4% with Turkey. In this context, the EU should not permit current challenges to weaken its overall enlargement strategy. The Western Balkans Summit last month was a positive step, provided that the countries still eager to join the EU do not lose sight of the need to enact deep reforms. The EU must not fall short of the expectations that Tesla undoubtedly would have had for it. All Europeans should be afforded the opportunity to participate in the European project and benefit from its transformative potential. That is precisely what a large segment of the Balkan population still wants. EU leaders cannot guarantee that the process of joining the bloc will be quick and easy. But only they can ensure that the journey will be worth it.